Khaw (right) points out the contraband beer crates on the lorries at the PGA headquarters this morning. KUCHING: Contraband beer worth RM516,000 was seized by the General Operations Force (PGA) together with the Malaysian Anti-Corruption Agency (MACC) in Serian at around 1.30am today. 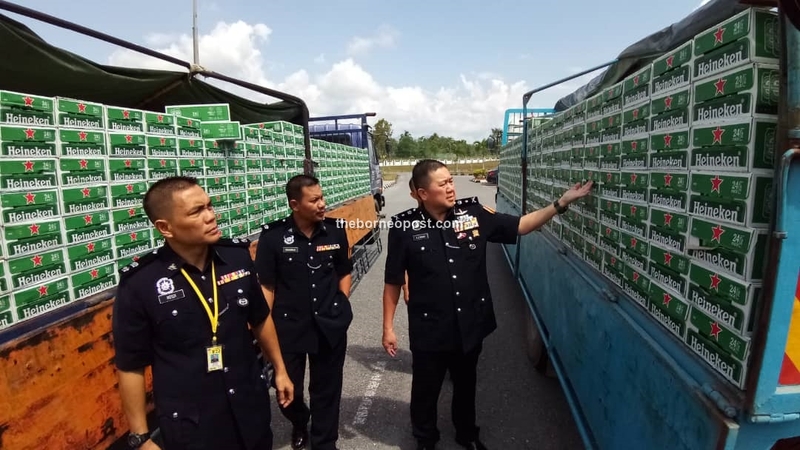 According to PGA commander SAC Dato Khaw Kok Chin, the contraband beer was transported on two lorries heading from Sibu to Kuching before it was stopped by the authorities at KM90 of the Serian – Sri Aman road. “Based on the information we gathered, both PGA and MACC personnel started to tail the lorries from Sibu until it made a stop at KM90 near a school,” Khaw told a press conference at the PGA headquarters this morning. After introducing themselves to the drivers, the authorities proceeded to conduct checks on their cargo, which revealed the 2,300 crates of contraband beer. The driver and co-driver of both lorries – aged between 22 to 33 years old – were also arrested after they failed to produce documents related to their cargo. “We believe that the contraband beer is aimed for the local market, such as restaurants and grocery shops,” he added. The case will be investigated under Section 135 (1)(d) of the Customs Act 1967. PGA will continue to monitor smuggling activities and syndicates in the state under the ongoing ‘Ops Libas’ operations, Khaw asserted.